This agreement has been drawn for a simple sale of copyright in one or more musical works or songs or lyrics alone. It is drawn as a sale so that the buyer has freedom to deal without the restrictions of licence terms, but provision has also been made for the composer to retain some rights. The retained rights could be any. Geographical territory or specific use would be the most common. If retained rights are more complicated, it would be better to use a licence agreement. 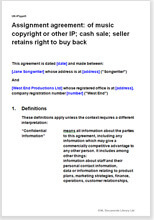 It is based on a sale of music or lyrics, but could also be used for other IP. It protects the interest of the seller without offending or prejudicing the buyer. It is as strong and thorough as documents drawn for more complicated deals. The document provides for a right of first refusal if the buyer decides to sell and a procedure to make that work fairly to both sides. The financial arrangement is a simple cash sale. Both sides are protected by reasonable warranties. Optionally, the seller can retain rights in certain circumstances or places or events. Conversely, you can limit the rights you sell. So that you can easily follow the effect of the document, we have given names to the parties and the subject matter. Net Lawman offers around 30 licence agreements and assignments relating to intellectual property in addition to those in website terms and conditions.